Natural language processing technologies have become quite sophisticated over the past few years. From tech giants to hobbyists, many are rushing to build rich interfaces that can analyze, understand, and respond to natural language. Amazon’s Alexa, Microsoft’s Cortana, Google’s Google Home, and Apple’s Siri all aim to change the way we interact with computers. Sentiment analysis, a subfield of natural language processing, consists of techniques that determine the tone of a text or speech. Today, with machine learning and large amounts of data harvested from social media and review sites, we can train models to identify the sentiment of a natural language passage with fair accuracy. In this tutorial, you will learn how you can build a bot that can analyze the sentiment of emails that it receives and notify you about emails that may require your attention immediately. The bot will be built using a mix of Java and Python. The two processes will communicate with each other using Thrift. If you are not familiar with one or both of these languages, you can still read on as the fundamental concepts of this article will hold for other languages as well. To determine if an email needs your attention, the bot will parse it and determine if there is a strong negative tone. It will then send out a text alert if needed. We will use Sendgrid to connect to our mailbox and Twilio to send out text alerts. There are words that we associate with positive emotions, such as love, joy, and pleasure. And, there are words that we associate with negative emotions, such as hate, sadness, and pain. Why not train the model to recognize these words and count the relative frequency and strength of each positive and negative word? Well, there are a couple of problems with that. First, there is a problem of negation. For example, a sentence like “The peach is not bad” implies a positive emotion using a word that we most often associate with being negative. A simple bag-of-words model will not be able to recognize the negation in this sentence. Furthermore, mixed sentiments prove to be yet another problem with naive sentiment analysis. For example, a sentence like “The peach is not bad, but the apple is truly terrible” contains mixed sentiments of mixed intensities that interact with each other. A simple approach will not be able to resolve the combined sentiments, the different intensity, or the interactions between the sentiments. The Stanford Natural Language Processing library for sentiment analysis resolves these issues using a Recursive Neural Tensor Network (RNTN). 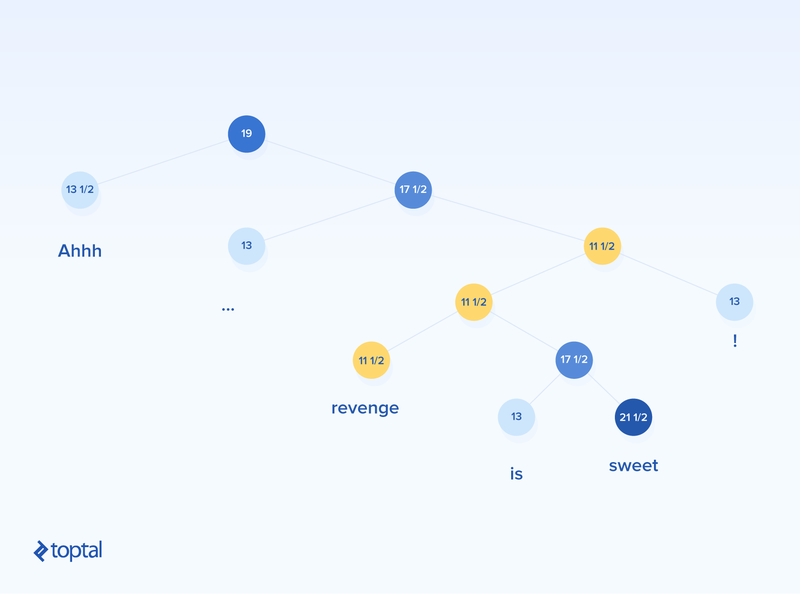 The RNTN algorithm first splits a sentence up into individual words. It then constructs a neural network where the nodes are the individual words. Finally, a tensor layer is added so that the model can properly adjust for interactions between the words and phrases. You can find a visual demonstration of the algorithm on their official website. The Stanford NLP group trained the Recursive Neural Tensor Network using manually-tagged IMDB movie reviews and found that their model is able to predict sentiment with very good accuracy. The first thing you want to do is set up email integration so that data can be piped to your bot. There are many ways to accomplish this, but for the sake of simplicity, let’s set up a simple web server and use Sendgrid’s inbound parse hook to pipe emails to the server. We can forward emails to Sendgrid’s inbound parse address. Sendgrid will then send a POST request to our web server, and we will then be able to process the data through our server. To build the server, we’ll use Flask, a simple web framework for Python. 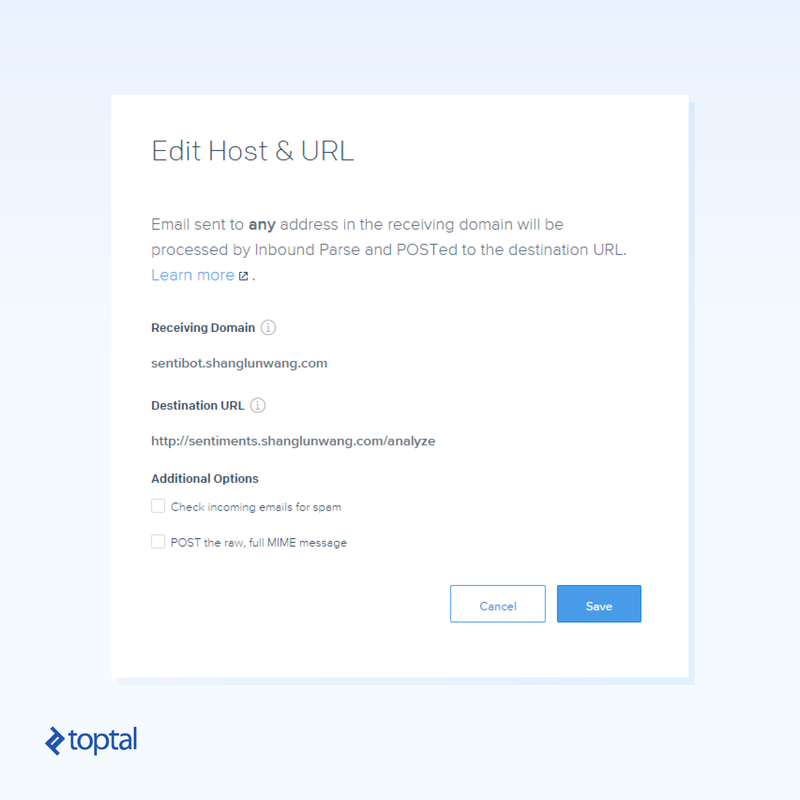 In addition to building the web server, we will want to connect the web service to a domain. For brevity, we will skip writing about this in the article. However, you can read more about it here. Building a web server in Flask is incredibly simple. Next, we want to send emails to this endpoint. You can find more documentation here but you essentially want to set up Sendgrid to be your email processor and have Sendgrid forward the emails to our web server. You can use any other service that supports sending inbound emails over webhooks. That’s great! You now have a bot that is able to receive emails. That is half of what we are trying to do. Now, you want to give this bot the ability to analyze sentiments in emails. Since the Stanford NLP library is written in Java, we will want to build the analysis engine in Java. Stanford NLP’s sentiment analysis engine can be accessed by specifying the sentiment annotator in pipeline initialization code. The annotation can then be retrieved as a tree structure. For the purposes of this tutorial, we just want to know the general sentiment of a sentence, so we won’t need to parse through the tree. We just need to look at the base node. So we have a sentiment analyzer program written in Java and an email bot written in Python. How do we get them to talk to each other? There are many possible solutions to this problem, but here we will use Thrift. We will spin up the Sentiment Analyzer as a Thrift server and the email bot as a Thrift client. Thrift is a code generator and a protocol used to enable two applications, often written in different languages, to be able to communicate with one another using a defined protocol. Polyglot teams use Thrift to build networks of microservices to leverage the best of each language they use. Note: I generated the code on a Windows machine. You will want to use the appropriate path to the Thrift executable in your environment. This handler is where we receive the analysis request over the Thrift protocol. The Analyzer uses the Stanford NLP library to determine the sentiment of the text and produces a string containing the sentiment annotations for each sentence in the text. Note that I did not include the SentimentAnalysisService.java file in here since it is a generated file. You will want to put the generated code in a place where the rest of your code can access it. Now that we have the server up, let’s write a Python client to use the server. Great! 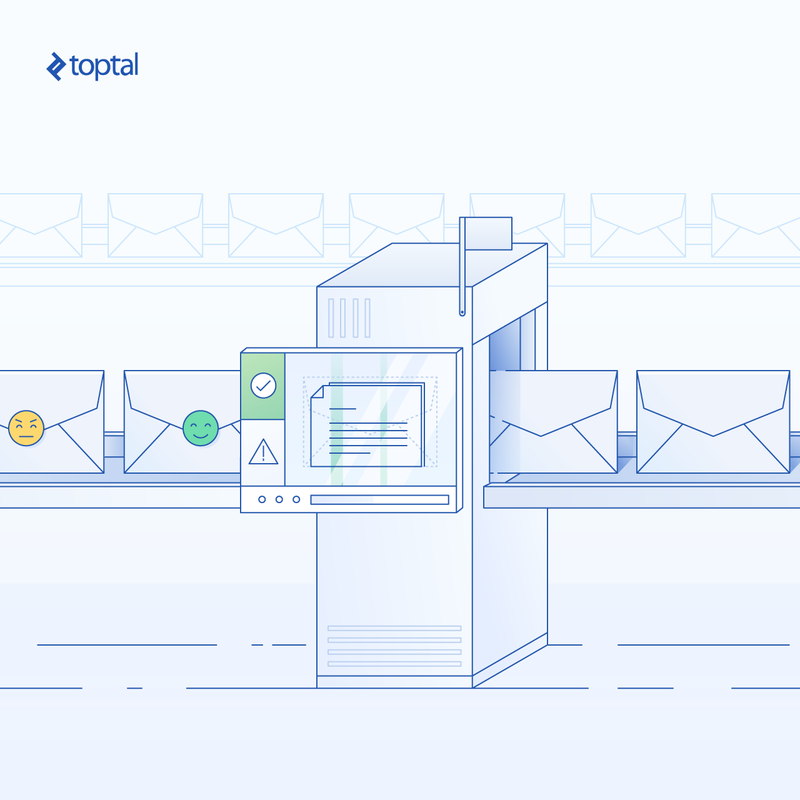 Now that we have the server running and talking to the client, let’s integrate it with the email bot by instantiating a client and piping the email into it. Amazingly wonderfully positive and beautiful sentence. All right! Now we have an email bot that is able to perform sentiment analysis! We can send an email over and receive a sentiment tag for each sentence we sent. Now, let’s explore how we can make the intelligence actionable. Received: Here is a test for the system. This is supposed to be a non-urgent request. Received: This is an urgent request. Everything is truly awful. This is a disaster. People hate this tasteless mail. We have built an email bot that is able to receive emails, perform sentiment analysis, and determine if an email requires immediate attention. Now, we just have to send out a text alert when an email is particularly negative. We will use Twilio to send out a text alert. Their Python API, which is documented here, is pretty straightforward. Let’s modify the analyze route to send out a request when it receives an urgent request. You will need to set your environment variables to your Twilio account credentials and set the on-call number to a phone that you can check. Once you have done that, send an email to the analysis endpoint and you should see a text being sent to the phone number in question. In this article, you learned how to build an email sentiment analysis bot using the Stanford NLP library. The library helps abstract away all the nitty-gritty details of natural language processing and allows you to use it as a building block for your NLP applications. I hope this post has demonstrated one of the many amazing potential applications of sentiment analysis, and that this inspires you to build an NLP application of your own. You can find the code for the email sentiment analysis bot from this NLP tutorial on GitHub. Natural language processing is the use of algorithms to analyze and understand ordinary human speech to determine metrics such as sentiment. What is the Stanford NLP library? The Stanford NLP library is a set of natural language processing software written in Java built and made available open source by the Stanford NLP Group. What are Recursive Neural Tensor Networks (RNTN)? Recursive Neural Tensor Networks are groups of neural networks organized in a tree structure where each node is a neural network. These are particularly useful in natural-language processing where the algorithm processes words and their interaction in a sentence. A very effective post. You have embedded the core NLP technology within other technology components so that all the working parts needed to make NLP useful are clear. is this sentiment analyser available in python?